30:75:100 – The Stoichiometry of Research, Science Education and Forest Conservation in Puerto Rico. 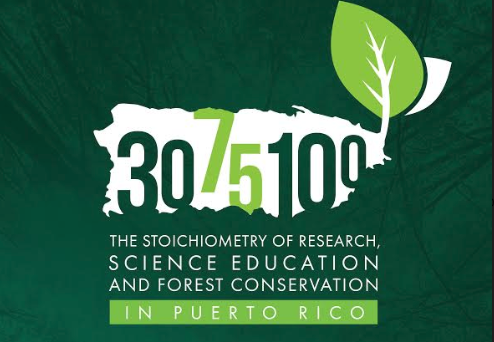 You are at:Home»Noticias»30:75:100 – The Stoichiometry of Research, Science Education and Forest Conservation in Puerto Rico. One hundred years ago in 1918, governor Arthur Yager established the Puerto Rico Forest Service as well as several Insular Forest Reserves. This action formalized under Insular leadership forest conservation in Puerto Rico. In 1943, Facundo Bueso became the first Dean of the newly established College of Natural Sciences within the University of Puerto Rico, a post he held until 1959 when he lost his life under tragic circumstances. Over the subsequent 75 years, the College of Natural Sciences became a leader in science education and research throughout Latin America. In 1988, the University of Puerto Rico received a grant from the National Science Foundation establishing the Luquillo Experimental Forest as a Long-Term Ecological Research program (LUQ LTER), which is still active and is conducting ecological research at the cutting edge of the ecological sciences. Stoichiometry refers to the proportion of things. The 30:75:100 can be reduced to 1:2.5:3.3, the stoichiometry of time between these events. For every year of advanced ecological research in the LUQ LTER Program, two and a half years were invested in science education at the College of Natural Sciences, and 3.3 in forest conservation by the government of Puerto Rico. The Department of Natural Resources and the Environment (DRNA) has been the host of the Puerto Rico Forest Service since 1972, before that, the Puerto Rico Forest Service was housed in the Department of Agriculture. Today, we celebrate the accomplishments and benefits to society of these three institutions and programs. The benefits from these activities (research, education, and conservation) demonstrably transcend the Puerto Rican society and reach regional and global scales. Most people intuitively understand the value of education and forest conservation, but are less certain of the nature and importance of ecological research. It is also less clear to most people how intertwined research, education, and conservation are and how they depend on each other to make their mark in society and improve the well-being of people. 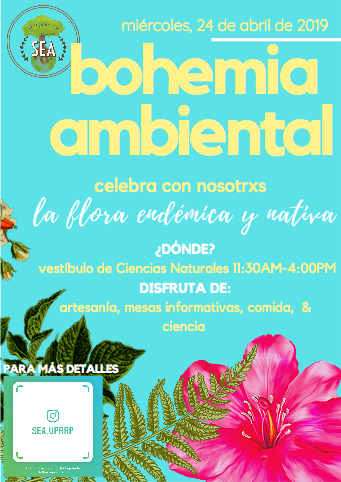 To commemorate the occasion, the University of Puerto Rico, the DNRA, and the USDA Forest Service joined efforts to organize a two-and-half day celebration on December 6-8, 2018. The activity has three objectives: 1. Make everyone aware of the history of accomplishments of these programs and institutions and how they relate to each other. 2. Explain the benefits that the Puerto Rican society derives from these programs and institutions. 3. Look forward to the next 100 years, anticipating the role that the programs and institutions will have in the reinvention of Puerto Rico after the passage of hurricane María. We also intend to have a fun and informative activity aimed at the general public. The activity will consist of an opening award ceremony (December 6, 2018), plenary talks, four interrelated panels of speakers, public participation through discussions, posters sessions, exhibitors, and a concluding discussion. 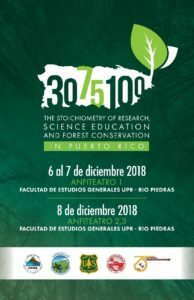 The opening ceremony, all presentations, posters, and discussions will take place at the Amphitheaters in the Faculty of General Studies of the University of Puerto Rico – Río Piedras Campus. We ask all speakers to address their comments to a general public audience and to relate their talks to the three objectives of the meeting. We will focus on the historical record during the first day of the symposium (December 7, 2018), and look ahead at the next hundred years during the second day (December 8, 2018). The plenary speakers of the first day will focus on the celebration of the history of the highlighted programs and institutions. These speakers will provide context for all following activities. Two other plenary speakers will set up the second day of the activity. The first panel of speakers will provide perspectives on: How do scientific research contribute to human well-being? The second panel of speakers will provide perspectives of: What are the benefits of science education to Puerto Rican society? How can these benefits reach regional and global scales? Looking ahead to the next 100 years, what do you anticipate is the role of science education in the reinvention of Puerto Rico after the passage of hurricane María? The third panel of speakers will provide perspectives on: What are the benefits of forest conservation by the Puerto Rico Forest Service to society? How can these benefits reach regional and global scales? Looking ahead to the next 100 years, what do you anticipate is the role of forest conservation by the Puerto Rico Forest Service in the reinvention of island after the passage of hurricane María? The fourth panel of speakers will provide perspectives on: Where should Puerto Rico be headed for the next 100 years in terms of public and private partnerships to leverage science, forest conservation, and community involvement for the benefit of human well-being? Presenters from all four panels will represent diverse scientific disciplines, and/or cross sections of society to include: professional, governmental and non-governmental organizations, community leaders, and partners from private sectors. The public will have an opportunity to comment and ask questions between panels of speakers. The formal component of the activity will be summarized at the conclusion by an independent observer of the proceedings. Posters and demonstrative tables on wood utilization, science education, scientific research and forest conservation will be in exhibit throughout the two days of the symposium and will offer details about the programs and opportunities in each of the three programs and institutions.